Equities start the day higher as a December to Remember begins! Who doesn’t love December? Everyone is in a good mood, the year is winding down, holiday decorations abound, and we get to guzzle eggnog, which is the best drink since someone mixed ginger beer with vodka. I love it, I’ll even take a bit of snow here and there without complaint. Did I miss anything over the past few weeks? The S&P was trading 2083 on Nov 18, it closed yesterday at 2080, so I guess no. Everyone be trying to catch winners like this but it’s impossible when the market decides that sideways ain’t just for Merlot anymore (how about the grammar in that sentence? Thank God I don’t have an editor). Lots of stuff on tap this week (two Yellen speeches, the ECB, and a jobs report) but honestly, does anyone think the market will do anything before Dec 16? No freaking way pal, the first rate hike since the Cretaceous period is going to cast an endless pall on price action. Ok, since there are exactly 20 settlement days left in the year I’m going to predict the final S&P print on Dec 31 (I like to wait to the end to make my predictions, forget all this “year in advance” nonsense). You ready? 2,101.58. BOOM baby, specificity isn’t just for stats class my friends. The market has been drawn to 2,100 all year like a moth to a flame so I’m sticking with that level for my endgame. Which is a shame really, all the narratives and worries and hand wringing may end up with a total return of 0-1%. ZZzzzzzzzzz. Anyway, bring on the final month of the year and 500 calorie drinks that I get sick of after one. After the open, there was an intense force trying to pull the market higher but a really awful ISM Manufacturing number kept us from going anywhere. 48.6…yikes…the worst ISM since 2009. Remember what Fastenal’s CEO said to us? “The industrial environment is in a recession,” so I guess this really shouldn’t be a surprise. Oberton is no dummie, that guy (and his company) are dialed in so you gotta pay attention when he speaks. Higher rates in two weeks? I mean why wouldn’t the Fed want to hike into a contractionary manufacturing sector, 1.8% GDP, and oil at $41. Seems like a no brainer to me. Volumes were light again but that will be the case for the rest of the year, you can’t expect a ton of activity with mere weeks remaining. Ok what did well today: WYNN, LLY, CNX, AET, MU, and AAL. Losers were CMI, CSRA, KMI, FMC, and CF. There was a distinct lack of individual stock news though. Cummins was the biggest loser simply because it caught a downgrade, I mean the stock has been falling for months now it’s not like anything new hit it. Which, frankly, is a problem for the market too. There just isn’t anything new and there won’t be for awhile. Test the highs, test the lows, grind sideways, close. You could copy paste that for last few weeks and it would be spot on. Stock valuations are just “average” right now so there’s no impetus in either direction. Do me a favor and go read this post, it’s really good explainer of where we are at the end of 2015. The rest of the day was actually higher! See…you doubters….all we needed for a 1% rally was a sub 50 ISM number! Let’s face it, none of this has to do with eco data or Yellen or the pace of rate hikes. It’s just Santa time. Let’s goto the great Jeffrey Saut for today’s ending factoid: “in the last 20 years, the large and small caps have been positive from November 20th into year’s end 18 times. Of interest is that the Russell 2000 (small caps) has, on average, gained 5.6% over that timeframe, while the Russell 1000 (large caps) has rallied 3.4%. Also of note is that, over the past 27 years, from December 16th through year end, the S&P 500 (SPX/2080.41) has been up 24 times and down only three times.” Ho Ho Ho my friends, welcome to the best seasonal trade of the year. Giddy up Rudolph. Final score: Dow +95bps, S&P500 +107bps, Nasdaq +93bps, Rus2k +50bps. Succinct Summation of the Day’s Events: Another sideway-ish day waiting for something from Janet and her crew. 2,100 is literally a magnet. Top Baby Names of 2015. Seriously, whatever happened to William or Kate or Elizabeth? Where did Izzy and Liam and Ava and Jackson come from? The funny part? My daughter has a friend with every single one of the top 10 girl names. Oh trendy parents…. 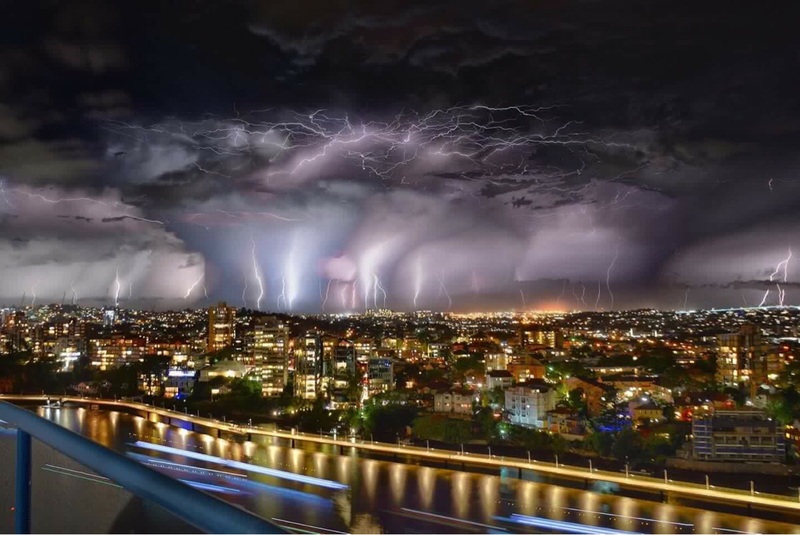 Aussie’s don’t mess around do they…even with their storms. Wait….Dunkin may start delivering? Oh man….I am so in: According to DoorDash, Dunkin Donuts will deliver a limited selection of coffee, donuts and breakfast sandwiches to a customer’s door in a suggested time of 45 minutes. I don’t know about that 45 mins though.. I will admit, credit markets scare me right now. They lead equities in a big way and they act anything but good. Goldman says “chill out” though: Rising risk premiums for U.S. corporate debt are sending a "false recession signal," Goldman Sachs credit strategist Lotfi Karoui wrote in a note to clients Tuesday. While risk premiums for both investment-grade and high-yield debt are at levels that preceded recessions in 1990 and 2001, the outlook for global growth in 2016 should underpin the market, he said. "We expect the macro environment to be broadly supportive for credit," Karoui wrote. "Credit markets are likely to be no better at predicting recession than any other asset market."